Johnny Manziel and Michael Sam were the two most highly anticipated prospects at this year's NFL draft. Yet, they're receiving two very different types of coverage on ESPN. When it comes to Johnny Football, ESPN asked Cleveland Browns general manager Ray Farm how Manziel looks on the field. "I think he's right where he's supposed to be," Farm told the network. "I think good old Johnny Football is going to be a good addition to Cleveland," center Alex Mack added. But, ESPN's been asking Sam's teammates questions about whether they've showered with the openly gay footballer. This morning's edition of SportsCenter featured a segment where reporter Josina Anderson got the scoop on the locker-room situation. 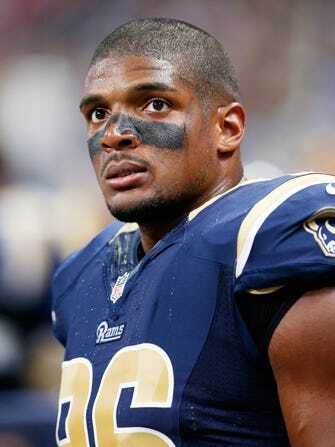 "Another Rams defensive player told me that 'Sam is respecting our space' and that, from his perspective, he seemed to think that Michael Sam is kind of waiting to take a shower, as not to make his teammates uncomfortable." Anderson shared other ways players responded when asked the question. Both Kendall Langford and Alec Ogletree informed the ESPN reporter they weren't exactly tracking his shower habits. The network's obsession with Sam's sexuality irritated a number of people, including Sam's teammate Chris Long, who shared his thoughts on Twitter.